SanDisk has announced that their fast Extreme IV compact flash cards will double their capacity to 16 GB. The whole Extreme IV card series also get improved speed performance with up to 45 megabytes per second. This speed should be welcome to professional photographers needing fast card in their high end DSLR camera that produces big picture files. The 16 GB version of the card will cost about $400. COLOGNE, GERMANY September 23, 2008 – SanDisk today announced that it is now shipping an upgraded family of SanDisk Extreme® IV CompactFlash®(CF) memory cards to better meet the needs of professional digital photographers. The entire series of SanDisk Extreme IV high-performance memory cards has received a 12.5-percent speed boost up to 45 megabytes per second (MB/s) 1 and the newly-released 16-gigabyte (GB) 2 card is twice as large as previous capacities. The announcement was made at the Photokina trade show where SanDisk is demonstrating products in Hall 5.1, Stand A20. SanDisk Extreme IV CompactFlash 45MB/s (300X) memory cards offer advanced technologies that are fully compatible with all CompactFlash cameras including the latest UDMA-enabled cameras. SanDisk Extreme IV CF cards have undergone internal testing with many leading manufacturers’ cameras and DSLRs, such as Canon’s EOS series, Nikon’s D300 and D3 cameras, the Sony Alpha A700, and the Olympus E500 and E3 cameras. Depending on the camera used, the increased performance of the SanDisk Extreme IV memory card line may help reduce the delay between shots, enabling photographers to take more photos overall. The high-speed cards let all photographers save time and improve their workflow with faster card-to-computer data transfer speeds. Rob Galbraith, a professional photographer and an independent digital imaging reviewer, tested the 16GB SanDisk Extreme IV memory card and released his review on www.robgalbraith.com. Following performance testing with the Nikon D700 and Canon EOS-1Ds Mark III digital cameras, Rob states that the 16GB SanDisk Extreme IV card offers the fastest write speed of any card at the 16GB capacity. He adds that such top-line performance can be expected when using the card with most or all current Canon and Nikon digital SLRs. ideal for professional photographers who typically shoot in RAW or RAW + JPG formats, which require up to ten times more card capacity than JPG images. In addition, photographers who regularly use burst or continuous shooting mode during high-action situations such as sporting, wildlife or fashion photography can also benefit from the increased capacity and performance. SanDisk Extreme IV cards carry a lifetime limited warranty and hold the industry’s widest guaranteed operating temperature range, from 13F (minus 25C) to 185F (plus 85C). Finally, Extreme IV CF cards can transfer data from card to computer using a SanDisk Extreme FireWire reader (sold separately), which helps speed up workflow by transferring large image files through the computer’s FireWire port at a speed of up to 45MB/s. 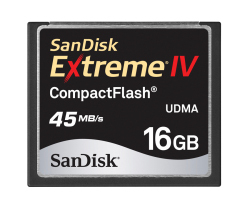 The 16GB SanDisk Extreme IV CompactFlash memory card is available now and it carries a manufacturer’s suggested retail price of $399.99 in the United States.